The methodology for learning and teaching human rights has long been an issue among human rights educators. 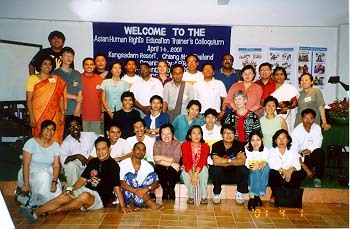 This is what the Asian Regional Resource Center for Human Rights Education (ARRC) wanted to discuss when it organized the Asian Human Rights Education Trainers Colloquium on April 1-5, 2001 in Chieng Mai. Over thirty participants from Asia gathered to share and learn from each other's experiences in the field of human rights education pedagogy. Twenty-one non-governmental human rights organizations and five regional non-governmental human rights organizations were represented in the colloquium. Human rights education trainers have articulated the need for an updated and user-friendly edition of the HRE Pack, an ARRC training manual. Suggestions for the new edition of HRE Pack were discussed during the colloquium. A number of participants shared their experience in using the HRE Pack. They found the publication useful. The experiences ranged from using the suggested modules, to employing the educational framework used in the publication, to translating part of the publication into their language. The translation of the whole publication was made by an NGO in Indonesia. The main person responsible for the translation was however not able to attend the colloquium. The participants suggested some ideas for the new edition of the HRE Pack, including stories about experiences in using HRE Pack, discussion on specific issues (migrant workers, child labor, political detainees, culture and human rights, development and human rights, etc), sample activities from various countries, glossary of human rights terms, local and international remedies. The participants presented their own human rights education experiences. They showed sample materials from posters to videos, and explained the methodologies employed. They also discussed the problems encountered. Some have problems using human rights or legal language. There is a view that they should be avoided especially in relation to specific communities. But there is also a view that it is necessary for people to understand human rights or legal terms because the larger society use them in a way that affect marginalized people. Various educational methodologies used throughout the region were examined and analyzed. Approaches, mechanisms and methods of human rights education were identified and explored. Case studies are used in the education campaign against domestic violence in Cambodia. Art competition highlighted the Rights of the Child in Nepal and in the regional visual art activity coordinated by ARRC. A representative from Sri Lanka raised the issue of human rights education and psychosocial healing. One other participant commented that making drawings or artwork is a good way for people to express their thoughts and experiences that helps them heal their trauma. There is also a mention of educational activities that are called by other names and yet essentially human rights education activities. They can be community organizing programs for grassroots communities, paralegal training to name a few. Presentations on the review of methodologies for formal and non-formal human rights education systems were made. It is said that institutions involved in the school programs are also taking steps to employ participatory teaching and learning methods. But participatory methods are not necessarily understood well. Some see them as merely meant for fun and without much learning to offer. They fail to appreciate the importance of methodology in learning the substance of the educational activity. The participants discussed the difficulties that non-governmental organizations experienced, and identified possible solutions. It is noted that some human rights education trainers are under-resourced and therefore unable to sufficiently meet the demands of the workload. ARRC announced the plan to hold a regional workshop in South Korea sometime in September 2001. It will be a training of trainers (TOT) workshop that will test some of the modules collected in the colloquium. Ms. Theresa Limpin is the Coordinator of ARRC.